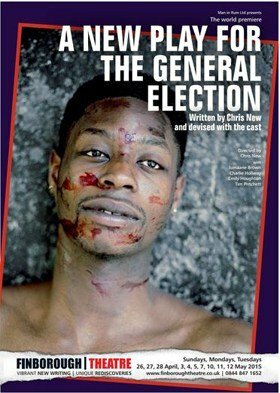 The world premiere of a play specially created in response to the General Election by award-winning actor/director Chris New opens at the Finborough Theatre for a limited run of nine Sunday and Monday evening and Tuesday matinee performances from Sunday, 26 April 2015 – with a special extra performance on General Election day itself on Thursday, 7 May (Press Night: Monday, 27 April 2015 at 7.30pm). Following the sell out run of The Precariat at the Finborough Theatre in 2013 and Smallholding at the Soho Theatre, Nuffield Theatre Southampton, and the High Tide Festival, director Chris New returns with a brand new play that will be written and developed in the lead up to the 2015 General Election. The run will be accompanied by the return of our FINBOROUGHFORUM, a series of informal discussions and debates on the General Election, after every performance on Sunday and Monday evenings. All events are free to ticket holders for that evening’s performance of the new play. FINBOROUGHFORUM events will all be Twitter friendly with live tweets from @FinboroughForum. Using the hashtag #finfor, the speakers will also answer questions posed on Twitter so everyone can be included, no matter where they are in the world. Additional performance on election day – Thursday, 7 May at 2.00pm. Performance length: Approximately seventy minutes with no interval.